Soon Jane is TV's hottest star. Fame brings more than she ever imagined possible for a girl from Santa Barbara - free designer clothes, the choicest tables at the most exclusive clubs, invites to Hollywood premieres - and she's lapping up the VIP treatment with her eclectic entourage of new pals. But those same friends who are always up for a wild night are also out for a piece of Jane's spotlight. In a city filled with people chasing after their dreams, it's not long before Jane wakes up to the reality that everyone wants something from her, and nothing is what it seems to be. but I did anyway. Even read the follow up book. I'm actually looking forward to a third; just don't take it too seriously. I liked that it was kind of based on LC's role in the Hills on MTV...It was what kept me interested. Great read for any reality tv junkie. I enjoyed it on a 19 hour drive...kept things interesting. I feel like I got a chance to be one of the "cool kids"
Growing up, through middle school, high school, and college, I've always been low-drama, no nonsense, "goody two-shoes" type of girl. But I always wondered what it was like to be one of the "cool kids." Well, reading this book gave me a good glimpse of it I think. The perspective, sleeping around, bad language, shallow values, and back stabbing that I'm glad aren't part of my personal real life. I guess I'm glad I listened to this book, Lauren Conrad did a great job reading it. I did enjoy it, but it's not something I'd want my daughter listening to. Even though it's a cliffhanger I'm not going to listen to the sequels. I should probably give myself some time before reviewing, but I wont. I'm a huge fan of The Hills, and this book is very similar, I found myself wondering who was who and if things really happened. For this being Lauren's first book, it was very good, and her narrating was perfect. My issue.. the ending. It ended so abruptly. Unless shes planning to make this a series (which should be listed) I'm left dumbfounded. What disappointed you about L.A. Candy? 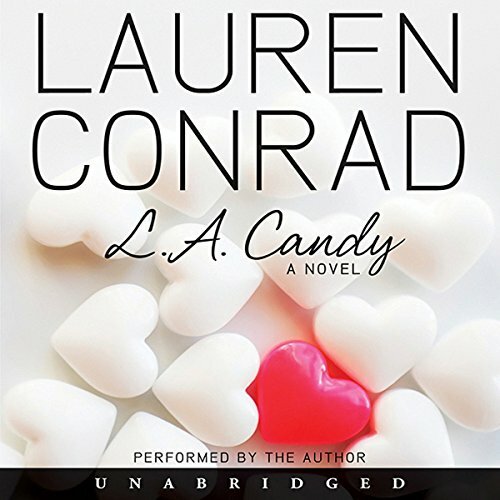 L.A. Candy was an exact replica of Lauren Conrad's journey into MTV reality fame. All she did was turn "The Hills" into "L.A. Candy"- how creative... Being casted for a reality show full of blonde rich girls fighting over nonsensical things, does not qualify you for writing. This was not even entertaining. Would you listen to another book narrated by Lauren Conrad? If you could play editor, what scene or scenes would you have cut from L.A. Candy? I would make LC re-write this book from beginning to end. I think it would have been more successful if we got Lauren Conrad's first-hand account of how "The Hills" changed her life; instead of her pretending to be a young-fiction author re-writing the terrible scripts of her 'real life' in "The Hills". it was really good I liked it alot and cant wait till the other books come out! The story line would entertain a teenager, up to 21 years even. I remember watching the Hill's when I was first in college and it appealed to me. I bought the book because I had numbers 2 and 3 in my library and wanted to read the series again. Now I realize too much time has passed. Apparently the first of a series. I was dissapointed on the ending, as it was a bit of a cliffhanger and I hadnt realized it was not a standalone. The book is amusing enough, though. LC is kind of boring in her narration, but it was inoffensive. Then you would probably like this book. It was okay. The story was cute, but if you've watched the hills, then you will know whats coming next, Also, Lauren Conrad should have taken the time to listen to a narrator or two prior to taking her go at it. She's kind of boring. All and all, i wouldnt pick it up again.